Beekeeping products – If you’ve ever thought about beekeeping as a hobby or an income source, now is the time to start. Beekeeping is a fun and productive endeavor you will want to continue for years to come. It’s essential to start beekeeping properly and with the best beekeeping products. Perhaps the biggest mistake amateur beekeepers make is taking on too large of a colony without sufficient experience. No matter how much research you do, you won’t truly understand the art of beekeeping until you have done it. It’s always better to start small and expand over the years. Beginner beekeepers should start with 2-3 colonies. Here are the essential beekeeping supplies for beginning beekeeping. They are all of good value and will work well for your needs. While you may want to buy a beekeeping kit to have everything you need, oftentimes, you will find you won’t use everything. It is easy to put together, very well-constructed and sturdy. The metal roof helps protect the hive from the elements. This hive includes a queen excluder. There are 20 frames. After you put it together, you will need to either paint the hive with two coats of exterior paint or stain it and then coat it with a clear polyurethane. This will help to weatherproof and extend the life of the beehive. You only need to paint the outside of the hive, not the inside! It’s smart to start with two hives, so you will need to buy two beehives. You will be able to manage both colonies better than just having one hive. If both hives are acting similarly, then it’s probably typical behavior. Also, if one colony becomes weaker (loses bees) you can have the option to add bees from the stronger hive to the weaker hive. If you have only one hive and something happens, it will be difficult to help it. If it dies off completely, you may have to wait months to start again. When it comes to buying a bee suit, there are many choices available. Even with the best suit, at some point during bee season, you will get stung. Still, you need to do what you can to minimize those instances. We recommend this protective bee suit. It comes with a veil for protection for your head and face. Choosing a beekeeper’s suit online is easy because the size is fairly forgiving. You want it loose enough to be able to wear your regular clothes underneath. And it’s preferable to wear long sleeves and pants, not shorts, under your beekeeping suit. In this way, even if a bee should make it’s way under your suit, you will be more protected. Whatever your size is in clothes is what you should order in a beekeeping suit. Manufacturer’s take into consideration you will be wearing your usual clothing underneath. A full beekeeping suit is much better than only the beekeeping jacket. We HIGHLY recommend the full bee protection suit. You want to eliminate any ways for bees to come up under your clothing. Always take the time to put on your full gear, making sure the veil is secured properly. Even very experienced beekeepers wear fully protective clothing. A beekeeper’s suit and mask and gloves are one-time purchases and will provide you with safety for years. You should wear them at all times. In addition to a beekeeping suit, a bee smoker is an essential item for when you are doing hive maintenance, harvesting honey, or doing anything around your hives. We recommend this bee smoker. You will need a smoker to calm the bees and to minimize their ability to communicate with each other. Using a bee smoker will help protect you from getting swarmed and minimize your chances of getting stung. For a bee smoker to do the job you need it too, calm the bees and ensure they don’t see you as a threat. You really want and need a large smoker. This 11″ smoker is far superior to the smaller 8″ smokers. It is so much better and will smoke longer, giving you more assurance the bees will stay calm while you are working among them. Another reason we like this one is because it comes with a 3-pack of fuel to get you started. What’s also great is that you can use other sources (pine needles, wood chips or scraps, sawdust, etc.) as fuel. You will need a beehive smoker for when you inspect the hive or are working on it. You will use it when you collect honey. As you become more experienced, you may want or need to work with your bee colonies to divide them or to merge colonies. You will use your smoker often. Depending on the size of your hand, there are two outstanding beekeeping gloves we recommend. One made from goatskin and one from cowhide. Both are are long enough to cover your arms and sturdy enough for you to handle the hives while offering protection from bee stings. They are easy to order online by choosing the size you would usually wear in gloves. We like the gloves from Natural Apiary because they are easy to work in — not stiff — and they are easy to bend your fingers and work on your hive. This is the best hive tool we’ve found for regular beehive maintenance. We prefer the J hook tool over the ones that are shaped like a crowbar. You will use this tool to pry apart the hives. With the blade, you can cut off beeswax. You really want a long hive tool. This 10.5″ tool is great because it’s easy to manage and keeps you a little bit farther away from the bees that are sure to be around. This hive tool is much better than the typical 8″ hive tools which are very common. It’s always handy to have some beginner beekeeping books on hand to help you get started beekeeping. What we like about each of these books is that they are great for beginning beekeepers and also for when you are further advanced, in months or years. The first book, Beekeeping for Dummies, is the one to buy if you can only purchase one book. These are the beekeeping books that we reference often. All three authors are all passionate about bees and beekeeping. All of these books are very well organized. You will find them all easy to read and easy to find the information you are looking for. This is an easy-to-understand, very comprehensive book. It is organized very well and the detailed table of contents makes finding the information you need, simple. There are excellent chapters about common problems and easy solutions. It contains 442 pages (this includes the detailed index). This book includes pictures, extensive information on what to do with honey, including honey recipes and more. Like any comprehensive guide, the only downside to this book is the small type. The headings are large and easy to read. Both of these are good resources as well and are just under 200 pages. This book has excellent pictures. It’s a great resource but would be our last choice of the three if you can only buy one book. It’s very handy to have beekeeping reference books to answer intricate questions about the type of bees you have along with help if you honey production varies from year to year. These books have been invaluable resources to help us position our hives, when to harvest honey, basics for beginners, and how to take care of the inevitable bee stings. You won’t need a honey extractor right away. You may want to wait to purchase one because there are the hives, bee suit, and other essentials to buy first. However, at some point you will need to buy a honey extractor. If you have the funds and can purchase it right away, great. But if you want to wait on this purchase, you can. You may also be able to rent the extractor if you have access to a local bee, apiary club. Generally, you shouldn’t harvest honey the first year you have a hive. Therefore, the honey extractor is a product you may want to consider as you go into your second year of beekeeping. We like this honey extractor in particular because it’s perfect for 1-3 hives, when you are just starting out. It’s a great value when you compare it to other larger-capacity honey extractors. If you find yourself wanting to own more hives and you will be harvesting a lot more honey, you will want to get a more robust honey extractor. But in the meantime, this is a well-performing, basic honey extractor. What is really great about beekeeping is there aren’t a lot of products and supplies required to get started. Where do I buy bees? You want to make sure you have all the equipment you need — on hand — before buying bees. You will also have to be sure it is the proper season to start. Build your two beehives; paint/treat the hives; and have your bee protection suit and other beekeeping products ready. In this way, you will be able to start beekeeping right away when your bees arrive. To begin quickly as a beginner, it’s best to start with purchasing a pack of bees. The alternative is to wait for wild bees find your hive. When you are ready to purchase a package of bees, it’s best to find a local beekeeper or a nearby commercial apiary. Otherwise, you can order bees online or over the phone. The bees will be delivered to you within a certain time-frame. The company will tell you in advance so you will be there to receive your shipment of bees. Be sure to read one of your beekeeping books to decide how to introduce the queen to the hive. You will learn about the direct method (faster but more dangerous to the queen) and the indirect method. Or you may decide to buy a nucleus hive. In time, you may decide to raise your own queen. The Beekeeping for Dummies book has an excellent chapter which gives you specific instructions on what to do when you inspect the hives. It’s also great for telling you what to do with your colony the week after hiving your bees, the second and third weeks, and the fourth through eight weeks. Basic, two-colony beekeeping set-up typically runs around $400 – $750. Most of the beekeeping expenses are one-time purchases. Prices will vary greatly depending on the types of bees you select. Remember, you don’t need to buy the honey extractor right away. Many beginning and amateur beekeepers want to harvest a lot of honey right away. However, when you buy the correct and best beekeeping products and start small, you can expand once you are more experienced. You will save money over the long run. Remember, like with starting any new hobby or activity, there are going to be important beekeeping products and ones that are nice to have, but not essential. Start with the essential beekeeping supplies first; buy other things as you learn more. Many people who want to begin homesteading start with bees. Beginning beekeeping is an exciting time. Know that beekeeping is a seasonal hobby. In the winter months you will need to check on your hives but there isn’t as much to do. Buy the best beekeeping essentials, read some of the book, check for a local beekeeping group, and get started. There is much to consider when you start any new hobby or business. 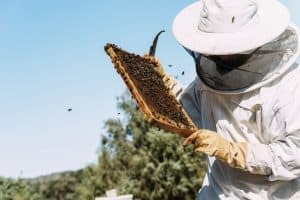 We love beekeeping because it offers sustainability, helps our environment, helps prepare for food crisis, and is a unique and interesting hobby. Once you progress with beekeeping, you can turn it into a small business, selling the honey honey combs, and so much more. Will I get stung beekeeping? Yes! You will get stung, despite wearing the best protection. Take time to learn about how to properly remove the stinger so the venom doesn’t get into your skin. Over time you there will be less swelling and you will become an expert at removing the stinger. The beekeeping books also cover what to do. Read these sections in advance of acquiring your bees. Elevate the hives a few inches above ground to avoid sickness-spreading moisture. Take precautions to protect the hives from bears, raccoons, skunks, and other predators, depending on where you live. The beekeeping books all cover pathogens, parasites and pesticides which could all affect your hive. If you are handy and you have the time, you may want to build your own hive. Know, however, that commercial hives have come down in cost considerably, and are more readily available than ever before. Therefore, when you consider the time involved, you won’t be saving that much by building your own versus buying a ready-made beehive. But you can have pride of builder-ship if you build your own. While you will want to make a detailed plan before you start, the basics of your hive must include the following. DIYers have had success using pine. Be sure to use enough waterproof wood glue as well. You will need to use a high-quality paint for outside protection when you are finished with it. Weatherproofing will help to extend the life and integrity of the hive while it is exposed to whatever elements, depending on where you live. You need to protect it from the sun, rain, and snow. You’ll even need to protect it from ants and termites (if prevalent in your area). If you paint it white or another light color, that will keep it cooler in the sun. You also may choose to line the outer cover with sheet metal for extra protection. But this is optional, especially if you use a good paint. After you have your commercially-purchased hives going, you can always take on the project of building your own hive. You will also have a better idea of the intricacies of hive-building once you own bees and have constructed a ready-made beehive. A DIY beehive is a great project for the winter when you will have to tend to your bees less often. To successfully raise bees, it’s important to understand the different types of bees and each of their roles within the colony. In beekeeping, the queen bee is considered the mother of the colony. Her only job is to lay eggs in the hive’s cells. She typically has a large, swollen abdomen that tapers to a point. She resembles the drone more closely than a worker bee. The queen’s body will be longer than that of the other bees. She has a stinger but rarely finds herself in a position where she needs to use it. When you become a more experienced beekeeper, you can learn how to raise a queen yourself. In keeping with their name, worker bees do most of the heavy lifting for the colony. They gather pollen, bring in water, build honeycombs, nurse the young, prepare food, and guard the hive. There are typically several thousand worker bees in a colony. They are equipped with stingers and will use them if threatened. They can be identified by the basket-like cavities on their legs that are used to store and carry pollen. Drones seem to be the least valuable of the honey bees. There tends to be about a hundred of them in a colony, and they are destroyed as honey becomes scarce. Drones are easy to spot due to their large, clumsy bodies and the loud humming sound they make with their wings. Higher than usual populations of drones may be an indicator of high honey production. Unfortunately, many consumers don’t realize there is a major difference between store-bought (“fake”) honey and raw, organic honey. In an effort to increase profits, many manufacturers put their honey through a process known as pasteurization. This high-heat filtration process removes almost all of the beneficial bee pollen, antioxidants, vitamins, minerals, and antibiotic properties. Today, 76 percent of all honey in grocery stores contains absolutely no bee pollen. Raw honey, on the other hand, goes directly from the beehive to the consumer. In its natural form, honey is one of nature’s most powerful super foods. You will want to join your local bee club if there is one near where you live. You will be able to learn from each other and deal with weather and other variables specific to your area. The American Beekeeping Federation is also a great resource. Perhaps you are interested in bees as a hobby or you’ve learned how bees are becoming threatened in our environment. Honeybees pollinate approximately 90% of crops in the United States. They are critical for our food supply. So while some beekeepers have taken up the hobby due to concerns over the declining bee population, others simply find joy in watching these industrious creatures thrive on their land. Many people start keeping bees for a hobby or for an income source. There are so many ways to earn income from keeping bees. They are fascinating, social creatures you will soon grow to love. Bees are one of the few species on our planet that fully contribute to their environment instead of just taking from it. Survivalists and rural-living enthusiasts understand the value of year-round gardening, preserving fresh food, and preparing for a possible food crisis. Beekeeping is a perfect complement to this way of life. Rural land owners, backyard gardeners, and most anyone can reap the benefits of beekeeping. With practice and patience, you will see how beekeeping is fun and fascinating. These are the best beekeeping products to start keeping bees. Beekeeping is a very rewarding and fun experience. If you have the desire and the funds to get started, go for it! It makes for an interesting hobby, and you can enjoy another aspect of sustainable living.